Losing someone to suicide is a unique loss like no other, and can lead to a number of conflicting feelings and many unanswered questions. There is no one way to feel or grieve the death by suicide—we all react and grieve differently. And most importantly, it is important to remember that you are not alone—suicide impacts more people than we often know about. 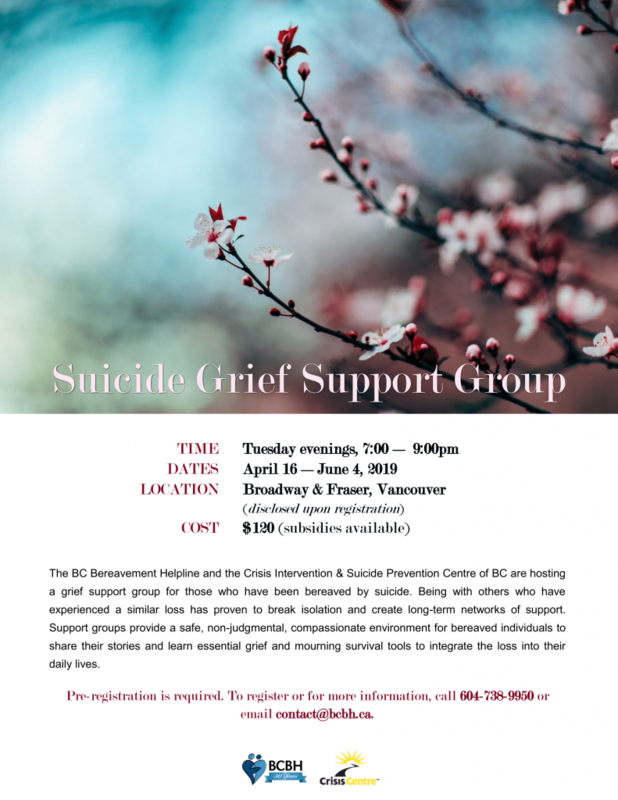 The BC Bereavement Helpline and the Crisis Centre are hosting a grief support group for those who have been bereaved by suicide. Being with others who have experienced a similar loss has proven to break isolation and create long-term networks of support. Suicide loss can be a unique and complicated grief. Jude Platzer, an initiator of this suicide loss program, knows firsthand the immense pain that comes from losing a loved one to suicide. After the suicide death of her teenage son in 1999, Jude has worked tirelessly in prevention and education efforts which have included supporting others who were dealing with suicide grief. This group will be led by two skilled, experienced and caring facilitators. For more information or to register, please contact contact@bcbh.ca or call 604-738-9950.